Imagine, if you can, a picturesque, 19th century tomato and banana plantation, located up the hill from Los Cristianos, where the air is slightly cooler and less oppressive, with stunning views of Montaña Guaza. Then imagine if someone bought this plantation in 2001 and undertook a complete renovation, turning the premises into an art gallery, bistro, bar and music venue. Well, this did indeed happen. A businessman named Wolfgang Egger bought the place, affected the changes and the result is this very chic venue for dining, listening to live jazz or South American guitar music and perusing fine paintings and sculpture. The Finca is, primarily, an art gallery, but is also an excellent place to call for a drink or a meal. The restaurant is open all day, as is the bar (although check below for more accurate opening times). A special weekly feature occurs on Sunday afternoons, when there is a barbecue, utilising the open terrace area. Choose from a huge selection of meats, generous portions, which you can enjoy along with salad and potatoes. As I said, there is the terrace area, which is shaded, but also the large garden, where you can enjoy the sun, along with the views. Although live music only seems to feature at the Finca twice a week, it makes up for it in quality. Currently (as far as I know), every Thursday evening, from 8pm till 11pm, there is the group Sudamericanto, a guitar group performing authentic South American music. The other live music occurs at the Sunday barbecue. 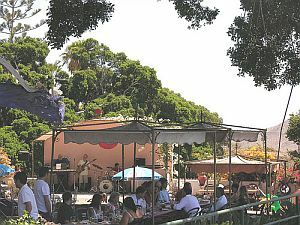 Often set up on an open-air stage, a small jazz ensemble provides ambient music while you enjoy the food. This lasts from 1pm till 5pm. To find the Finca, take the road out of Los Cristianos towards the motorway, then keep going straight on, so you pass under it. You'll come to a climbing road, signposted Arona. Stick to this and, eventually, you'll see a sign for the Finca, off to the right. For those of you not starting from Los Cristianos, get on the TF-1 and leave it at junction 72, taking the TF-28. This is the road climbing up the hill.